Melt the butter in a large pot over medium heat. Saute the onions and celery in the butter for 5 to 10 minutes, or until tender. Stir in the water and potatoes, bring to a boil and then simmer until the potatoes are tender. Add the cheese and stir until melted. In a separate small bowl, combine the flour and the milk and stir well until the flour is mostly dissolved. Pour this into the soup slowly, stirring constantly, until soup has thickened, about 5 minutes. Garnish with the parsley. 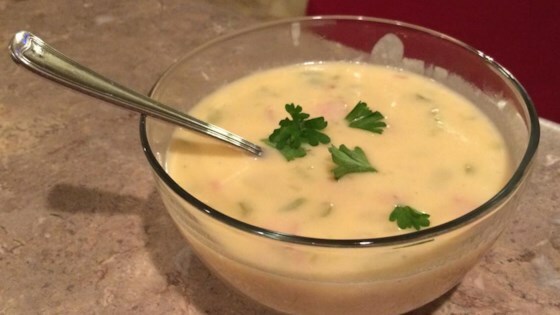 This is a wonderful recipe, if you want to you could add a little sour cream, for more creamier soup you could add a little more cream (heavy) or you could always add a little green onions! Wish I could give this one 10 stars. It will be on my list of favorite recipes and I have been cooking for many years. I used Velveeta for the American cheese slices and could get enough of it!